Home / Amazing / News / Viral / Pinagtawanan Siya Matapos Siyang Gumastos Ng Malaki Para Sa Napakalaking Plastik! Pero Lahat Ay Nagulat Nang Bumaha! Pinagtawanan Siya Matapos Siyang Gumastos Ng Malaki Para Sa Napakalaking Plastik! Pero Lahat Ay Nagulat Nang Bumaha! 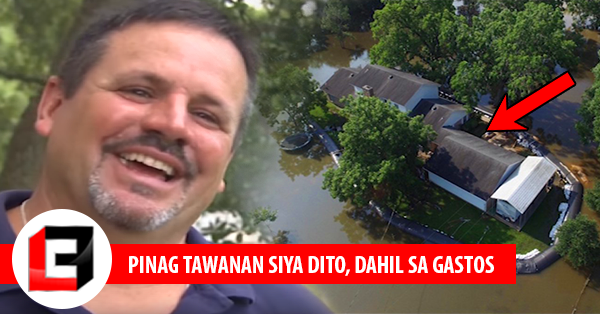 A man from Texas had spent $8,300 for an Aqua Dam that saved his home when the huge flood came! We all want to prepare for the rainy season. Most of us are fixing the roofs of our houses and the leakage to prevent water from entering our homes, sometimes, we even stock food at home so that we would no longer have to get out of the house since it’s dangerous. But do you think that you can prepare for a huge disaster like a flash flood? It’s pretty hard to prepare for a flash flood since it can take down your house in no time. But then, this man from Texas actually prepared for it! Randy Wagner from Rosharon, Texas, isn’t one of those who packed all his necessities to evacuate. In fact, he chose to stay in his home and do something to protect it from the flood. The authorities in his area warned them that the area would be flooded and so Wagner has decided to build a man-made Aqua Dam to save his home. He was trying to avoid the costly repair that his house would need when it gets washed away by the flood and so he started to do a research on how he could prevent water from engulfing his home. Soon enough, he discovered ‘Aqua Dam’. An Aqua Dam is a 400 ft. tube made of plastic. The effects of this man-made dam are similar to the effects of putting sandbags around an establishment. In hopes of saving his home, he asked another man to help him and surprisingly, all their efforts were worth it! Their do-it-yourself dam had saved his home from the 27-inch high flood! He spent $8,300 for the Aqua Dam, but it’s nothing compared to the $150,000 that he would need to repair his home. While his neighbors who mocked him evacuate, he was in his home, waiting for the flood to see if it would work. Prevention indeed is better than cure! His neighbors must have stopped mocking him after they saw the results of his hard work. Read also the previous article: Sino ang Pinakamaganda Para sa Mga Koreans? Liza Soberano, Maine Mendoza, Kathryn Bernardo, o Nadine Lustre? Alamin Dito!